Why does this type of Lightroom autumn presets is so popular among photographers? Autumn is probably the most favorable time for photography. Majestic landscapes attract by the diversity of red, orange, cold, and yellow colors and tones. 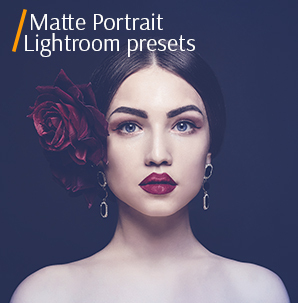 Professional photographers have made unique top Lightroom presets to make exhausting retouching easier, the outcomes appealing. All fall images convey a special atmosphere, but how did they achieve that effect? 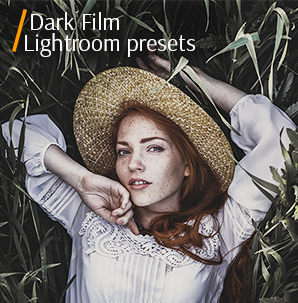 Our company has the answer — make it through the use of free professional Lightroom presets. Autumn Lightroom presets will help you transform you autumn portfolio as you dreamt. We have 10 plugins that can be used to increase the brightness of most autumn landscapes and fall portraiture. It is very convenient to use special settings to liven up autumn gold background — free autumn Lightroom presets must be on your laptop. Everybody knows how to use Lightroom presets but not everyone can find free professional Lightroom presets. The plugins we offer you are the best free Lightroom presets for fall photography, you won’t regret using them. LR Preset #7 "Soft Skin"
LR Preset #10 "Sunny Day"
These Lightroom presets for professional photographers are made specifically to enhance the ever-changing season, that is fall through color correction and image Photoshop enhancement. Ten Lightroom autumn presets will help you adjust the fascinating world of color in your portfolio. In the settings of these plugins you will find the light and color adjustments, which help you boost the color palette. All these free professional Lightroom presets are autumn themed and have a gentle vintage effect. Within few seconds, they transform dull pictures into stunning pieces of art. Free fall presets for Lightroom are a life-saver for any photographer and editor. These are the top Lightroom presets that you can download now. Fall Lightroom Presets #1 "Warm"
This free Lightroom fall preset for photographers adds more light: the closer to the center of the image, the lighter. The darker the original image is, the greater the effect becomes! It’s a perfect decision when you want to give a vintage touch to your photo. These settings emphasize the beauty of autumn landscapes and are highly recommended for portrait photographers. 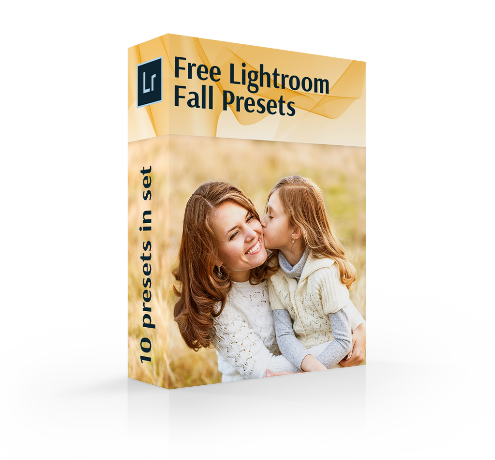 Free Fall Lr Presets #2 "Portrait"
The following free Lightroom preset is absolutely good for autumn photography. It will make the colors stand out. If you have a photo that lacks brightness and vibrance - this plugin is ideal for you. Fall Presets Lightroom #3 "Soft"
This autumn Lightroom preset increases the contrast, while blurring light shades. The plugin does not work well with evening images of the night sky, but it works incredible with well-lit landscapes, adding charm to them. It helps to emphasize the look in close-up portraits. Lightroom Fall Presets #4 "Matte"
This Adobe Lightroom preset for photographers adds autumn effect to the photo, increasing the contrast and brightness. It creates stunning results and livens up dim images. It is best suited for retouching street photography. Free Lr Presets Fall #5 "Film"
This free autumn Lightroom plugin is created specifically for High End free fall photography. It makes the colors dramatically pop, helping to achieve that perfect fall look and giving your photography a fashion life! Fall Presets for Lightroom #6 "Contrast"
This free Adobe preset is a perfect choice for autumn photography, which will give your fall pictures the amazing color grading. 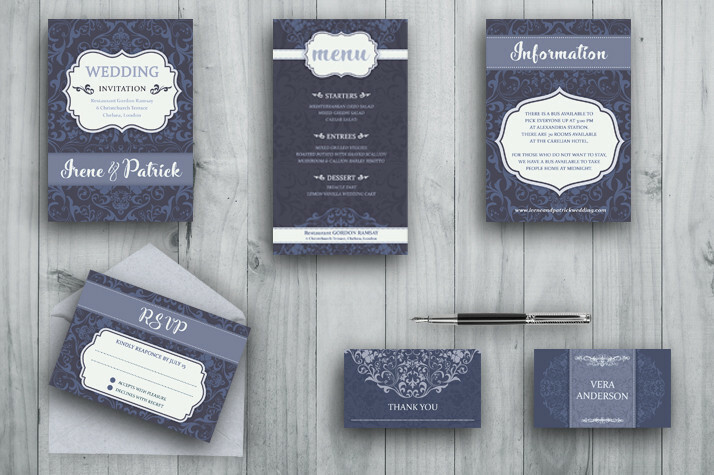 Here the emphasis is on the cold shades, which creates a lovely faded look you can see on the sample below. Fall Lightroom Presets Free #7 "Soft Skin"
Use this free fall Lightroom preset to give your pictures a gentle touch. It's a plugin that reduces clarity, adds light colors and softens the skin tone, creating the cozy and a bit moody feeling. Recommended for free fall portrait photos. Lr Presets for Fall #8 "Brighten"
This professional Lightroom preset adds brightness, emphasizes green and yellow tones. While it’s perfect for enhancing landscape photography it’s not recommended for portraits, since it can give an unnatural shade to the skin. Free Fall Presets for Lightroom #9 "Pastel"
This free fall Lightroom preset creates a nice, soft and creamy pastel effect. Warm tones and amazing pastel coloring will give your photographs a unique, dreamy style. As a result your fall pictures will look so calm and pretty! Lightroom Presets Fall #10 "Sunny Day"
This free Lightroom preset darkens the edges, making the center of the picture brighter. It works well with bright and rich colors in photos. Are highly recommended for portraits and children photography. Want to make something special with your free fall photographs? Add photo editing effects or photo manipulations - adjust such photos with our Lightroom fall presets designed specifically to give your images a new life. Professional free fall Lightroom presets are not easy to find, but we have them without additional charge, and not only for our customers. These free autumn Lightroom presets were made by our head photo retouchers, professionals in this business, to give your fall photos the desired look and are welcome to use them to retouch all kinds of photos. 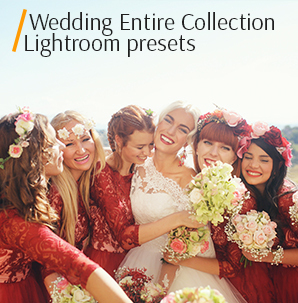 They are the best Lightroom presets for photographers and easy in use. Some plugins won’t work with certain pictures, that’s why you should experiment to find out which one of the gathered effects suites your photograph the best!